This post will stay up until 15th of July so for new posts read below! Say yay!!! I decided that I have left my followers a bit neglected, so here's my plan on how to remedy just that. I have made this huge giveaway. It will be open till 15th of July. OK - this cutie will not be included in the package, but I just couldn't not post this pic :) My hubby is home so rarely that every opportunity to share something with him is something I just can't miss. But what's really is in the package to be given to one of my followers? Here's what. 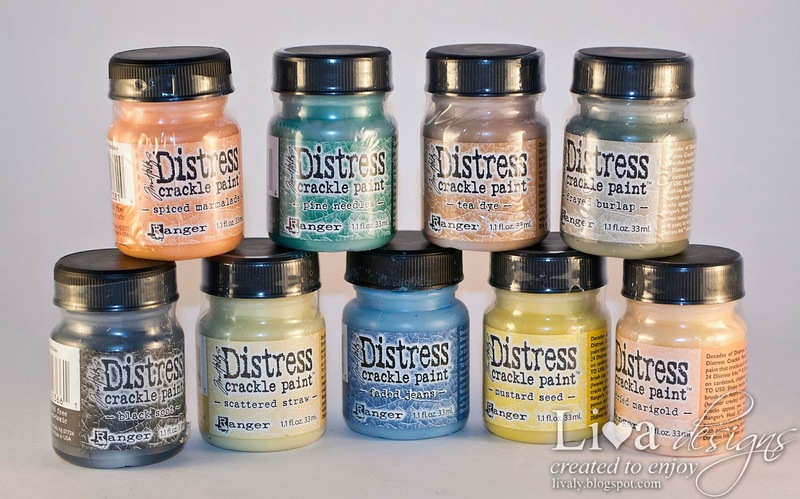 First it's 9 jars of Distress Crackle Paint in wonderful tones: Mustard Seed, Frayed Burlap, Scattered Straw, Dried Marigold, Faded Jeans, Pine Needles, Spiced Marmalade, Tea Dye, Black Soot. 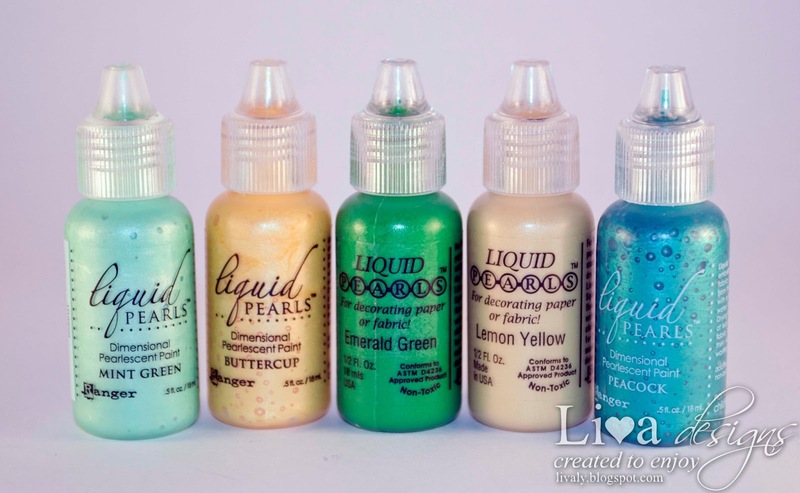 Then there's 5 Rangers Liquid Pearls in Mint Green, Buttercup, Emerald Green, Lemon Yellow and Peacock. I love the Peacock color so much - it's such a brilliant blue greenish tone! 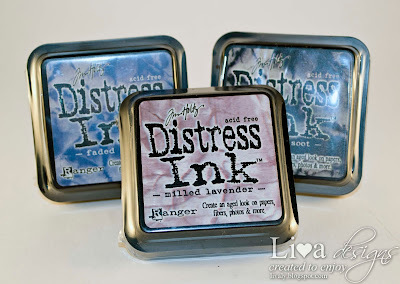 And what's a fab crafty prize without some great dies? I will give one lucky winner two Spellbinders dies of Small Circles and Small Scalloped Circles. And... one of my most favorite dies - Tim Holtz Caged Bird Bigz die! 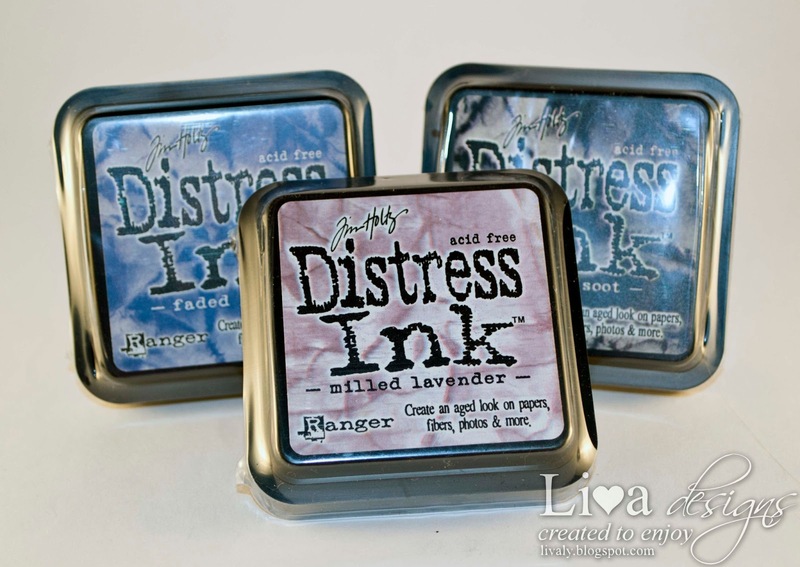 Distress Ink can never be enough, so I threw in 3 matching colors - Black Soot - black is black and can never go wrong with that - Faded Jeans and Milled Lavender to complement the black! 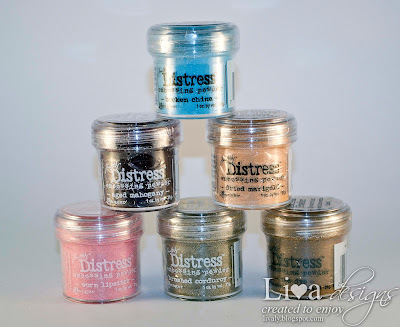 Whenever your crafting projects call for more texture, one of you will be able to grab some Distress Embossing Powder and add something interesting. 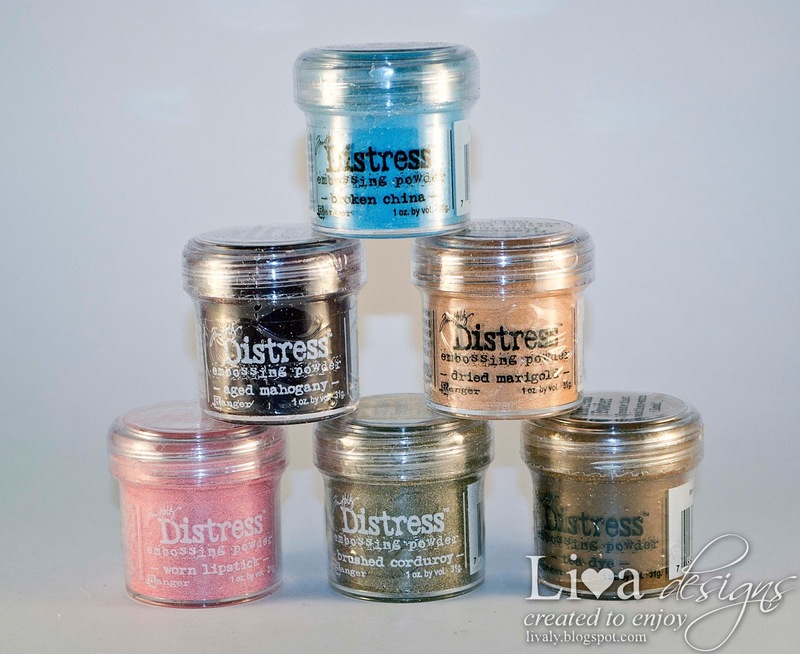 These 6 powders include Broken China, Tea Dye, Worn Lipstick, Aged Mahogany, Brushed Corduroy and Dried Marigold colors. 3. Follow this link, choose three dies that you would like to have most and write that into a comment below. Just don't forget to write your e-mail as well, so that I could contact you in case if you're the lucky one. And There is an additional chance to get an entry in this giveaway - post about this giveaway in your own blog side, twitter or Facebook. Write new comment for each of your posts and you will have additional entry! Who knows - maybe you will get some more surprises at the end of this giveaway! So my dear followers - good luck to you all! yep, I need to make more projects for my guys! grins! I've pinned this to my 'craft ideas' board and added it to my blog sidebar. I posted about it on my blog and FB! I pinned to Pinterest!! Thanks so much for a chance to win!! What a lovely giveaway! Thanks for a chance to win. I've pinned this on m Pinterest board called: Cards. and yes, I do follow! Oh, the 3 dies I've love to win are: The Garden Variety Set, Hello Summer, and The big multiple Stars! this is now going up on my sidebar with candies! This is such an amazing give-away! All these items look so cool, thanks for the chance to win! I posted it on my Pinterest board (http://pinterest.com/hanneke1988/craft-ideas/). Ooh, I also posted your candy on my blog! Hi, Liva! This is a very generous giveaway! This is a lovely giveaway! I have been your follower for some time time now. 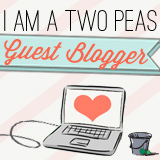 I am not on pintrest but I will advertise your giveaway on my blog. 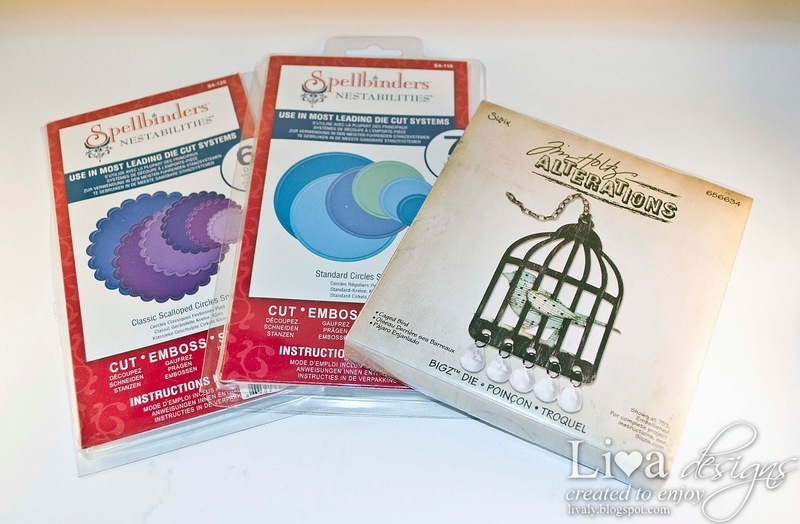 The dies that I liked from the link were Sizzix Framelits Die Set 5PK w/Stamps. Hope you have a good day and thankyou for you genorosity! Your blog it's so interesting, dear! I am also linking to your candy in my sidebar. LOL the second photo! made my day! I already follow your blog! thanks so much for the chance to win! What a cute giveaway! Thank you for the chance! 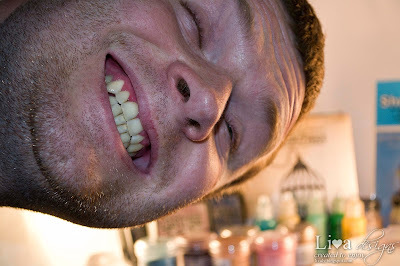 Wow…Wow…Wow….What else can I say after having a look at the candy pic. These Ranger stuff is so addictive. I have recently fallen in love with the Distress inks n got six shades of those which only my pocket permitted. 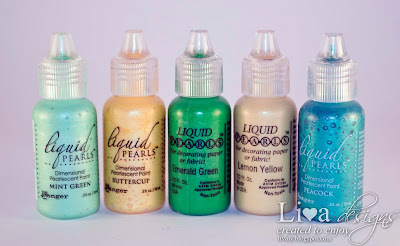 Have posted about the giveaway on my blog post. I pinned to Pinterest!! Thank you so much for a chance to win!! Hi Liva, can not seem to open your tutorials , have gone through lot of your posts, loved being in your creative space and would visit often. Have posted on the sidebar about the candy!! 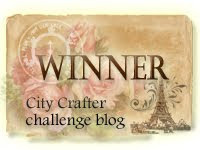 Thats awesome Liva its so generous of you giveaway so much crafty things. Already been following you. 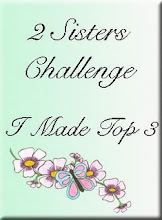 I am posting your giveaway on my blog's sidebar. Sorry I do not have pinterest ID. Thanks for the chance to win. Love. 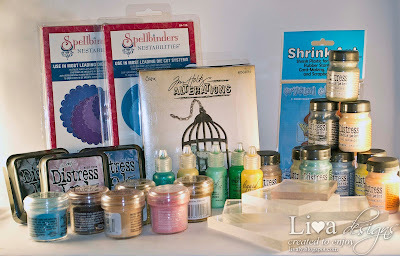 Sizzix dies collection is like ocean, each and every die is unique and beautiful. 3.Sizzix Sizzlits Die Set 3PK - Floral Botanical Set. oh my GOD its soooooooooooooo much.... I am your new follower and wanna participate for the draw. Loving it. Thnaks for the chance and I have posted it on my sidebar. went through your store... you have an awesome collection!! Posted on my blog sidebar too.. I'm already become your follower and have posted our giveaway in my blog. Sorry i don't know what is Pinterest. The 3 dies that i would like to have. I'm not into crafting as craft product are very expensive and very difficult to find material at my place. So recently i'm into decorating Indian Door Gifts which is small and cute items and of course it would be an easy job compare to craft. But i'm very interested to join this contest as if i win it, of course i would do something out of it. This 3 dies that i would like to have because it look cute and applicable for a lot of things. Thank you. Thanks for the chances in your wonderful giveaway. I just had to come back to see the goodies that you have included in this huge giveaway. (Plus I don't see my original post) So here it is again: https://www.facebook.com/ReneeC23?ref=tn_tnmn,http://domestikdivadesigns.blogspot.com/,http://pinterest.com/reneec2023/. My email address is: domestikdiva1@hotmail.com. Again, thanks for the chance to add to my stash! !